The caption to the side of the photo of a low cost, fiberglass, Ryland Homes initial HVAC air filter above says: "THE WORST AIR FILTER" on the "AMERICAN ALLERGY SUPPLY HOME PAGE" entitled "Pleated Air Filter Testing Using Dylos Air Monitor Laser Particle Counter". That photo is near the bottom of that page, and a little further down it says "FIBERGLASS PRICE 50 CENTS The Worst Air Filter". Before you continue reading this post, please keep in mind that my wife and I did not enjoy our first year of Ryland Home ownership. See "My Last Ryland Homes Blog Post & My Attempt To Help Ryland Homes!" to get a better overview of our Ryland Home complaint to the BBB, and links to the over 100 Ryland Home problems that were all eventually fixed after 13 months of having much of our time wasted. Now, granted, while American Allergy Supply is trying to promote their own high end home air filtering devices, I really don't believe that their statistics are too far off. Why, because my wife and I experienced some terrible night's sleep with much dust being recirculated into our faces at night in our new Ryland home. Our noses were stuffed more than expected (all new homes give off chemicals from carpets, etc. that can cause stuffiness) until we put a pleated MERV10 air filter in on a temporary basis until we go to MERVE 8 to be less air flow restrictive. Then, our noses were still stuffed like in our other previous new homes, but much less than before. I then bought new air directing register vents that directed the air away from our faces at night. That helped, too. 12/09/08 UPDATE: Before you continue reading the second page of this post, I wanted to let you know that in a 12/09/08 press release from Ryland's Jacksonville, Florida public relations firm, it says that the Ryland Homes there have "14-SEER HVAC systems" while the South Carolina Ryland homes only have 13 SEER. But, most importantly, it says that in Jacksonville, Florida, Ryland puts "4-inch hospital-quality air filters", while in South Carolina they put the cheapest 1 inch fiberglass air filter, and sometimes don't even change it out (as mine wasn't) after all the construction dust, etc. accumulated from building the house! Ryland's Florida homes also come with programmable thermostats which is an extra expense option in SC. See the "About Ryland Homes" section two paragraphs down after the press release, "Ryland Homes Jacksonville Division President accepts “Good Neighbor Award”. Maybe the Ryland Division Presidentin Charleston, SC needs to be more like the Ryland Division President in Jacksonville, FL in many ways? When the HVAC units and air filters are put in, Ryland Homes (and probably many other builders) still can have a lot of dust particle creating work to do on the house on top of all the dust generated by previous construction work. 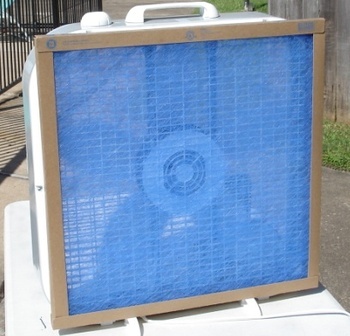 Our inexpensive (and very poor filtering) fiberglass filter from Ryland Homes (An Analysis of the Effectiveness of Air Filters on HVAC Systems says "A very low-cost disposable fiberglass furnace filter may have a MERV rating of 1 to 4 - pretty low.") was so overloaded with dirt and dust when I changed it from our hallway ceiling soon after moving in, that much dust fell on to me and onto our floor. When I brought it outside to dispose of it, it continued to spew dust into the wind in an open construction disposal bin for quite some time. It is our strong constructive suggestion that Ryland and other builders use a medium MERV (ranges from 1 to 16 MERV) pleated air filter to initially clean most of the air particles from the construction dust when they deliver the home, and then give (or strongly suggest to buy) another air filter withing 2 months after moving in. This may cost the builder a bit more (fiberglass = about $50 cents? VS. pleated Arm & Hammer MERV 10 = $7.97 at Home Depot), but it would be a great "buyer benefit" marketing tool to help sell new homes, in my opinion. My wife and I are sleeping better now that the air flow is away from our faces all night, and the Arm & Hammer MERV 10 air filter has filtered most of the dust particles that were formerly being recirculated. 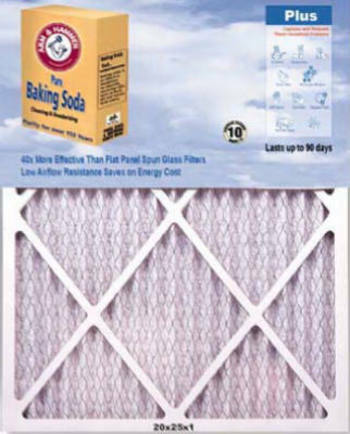 We will drop down to a MERV 8 Arm & Hammer because of what the American Home Supply home page says: "1 inch pleated air filters you buy at the hardware store should not be used in residential applications because they restrict air flow in most homes. They will eventually clog and ruin the air conditioning compressor if you forget to change them." The key is to NOT FORGET TO CHANGE THEM! We will stay with Arm & Hammer because of what their 2 pages of information says: "Low airflow resistance for better equipment operation and to help save energy." I believe this as I put my hand in the way of the air flow coming out of the register before and after the switch to the MERV 10, and the air flow seemed the same or better to me. We are not sure if it is helping with chemical "odor control" as advertised, but we like the possibility of that benefit. Please keep in mind what this web page says below "The Definition of Air Filter MERV and what MERV means when buying an air filter" at "Air filter density and reduction in airflow:" = "some air filters may be so dense that the cubic feet per minute of air that can pass through them is reduced drastically. Check with your air conditioner or heating system installer or service technician to review the intended air flow rate (in cubic feet per minute) of your system and on the effects of installing a better, more efficient but slower-air-passing filter. An HVAC technician and some home inspectors have equipment that can easily measure the air flow rate at a given point in the system." May just depend on whoever is managing it locally. I don't know what kind of heat pump or A/C you have, as that might affect Ryland's decision? In any case, I'm hoping that my constructive suggestions regarding many things will bring a more enjoyable Ryland Homes customer experience than my wife and I had in our first year for all new customers with every home they build anywhere. Thanks for the potentially encouraging comment.